Last weekend on the site, Jon Holmes looked back at the Rainbow Laces activation in November / December 2017, and picked out some ‘media moments’ that defined the campaign message and helped make a difference. 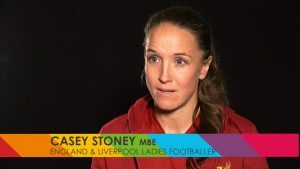 It’s been almost four years since Casey Stoney came out publicly – but as all LGBT people know, however out you are, it’s something that never actually ceases. A relationship, a friendship, an interest, an activity, a social media interaction… at some point, every now and then, a situation arises whereby someone new learns that you’re lesbian, gay, bi or trans. Casey’s story from Sky Sports‘ ‘My Icon’ interview in November was one of my favourites from that series. She explained how she arrived at the crossroads of potentially speaking to the media about her sexuality – the sense that times were changing but that some were still struggling, the responsibility of being England captain, the happiness in life that she had found personally. The final hurdle to overcome was the one she couldn’t control. It was the fear of judgement from everybody else. As a player, as a footballer, you get judged every day. What do you look like, how do you play, how do you perform, what’s your diet like – you’re judged on everything. That was the part of my life that I was most frightened of being judged on. Casey overcame the fear and as she says herself, “the reaction was overwhelmingly positive”. Yet that fear remains very real for many others, and in sport – with all its traditions and stereotypes, and often with the intense focus of the public eye – it’s heightened still further. Sexual orientation or gender identity don’t have to define those of us who are ‘out’; but to varying degrees, it becomes part of us and helps shape our world view, and sometimes our sense of purpose too. Perhaps we’re simply a bit more open on Instagram; perhaps we start to actively fight more for causes close to our hearts; perhaps we prefer to keep certain boundaries in place. Every LGBT person deals with it differently – even after we first come out. That diversity within diversity was also apparent in the list below of 10 LGBT sports interviews from 2017 (ordered alphabetically by surname). All the stories were moving, inspirational, honest, entertaining or just matter-of-fact – and often a mixture of all of those. They were also authentic. Around the world, other LGBT people will have read or watched, and felt empowered; stronger connections will have been formed between those athletes and fans new and old; and for a few stars of tomorrow who are also LGBT, they might have seen reflections of their future selves. Thanks to the men and women below for sharing – and to anyone reading, please let us know any other 2017 stories we’ve missed that had an impact on you. Here’s to more in 2018! Being gay doesn’t matter in the context of refereeing a match but if I’m speaking about equality and diversity, then I’m going to mention that I’m gay because it’s relevant. At the start of the 2017/18 season, Ryan Atkin became the first person with an active matchday role in UK men’s professional football to come out in almost 27 years. The 32-year-old, a National League South referee and EFL fourth official, explained how being promoted back to the pro ranks after a previous demotion presented him with two opportunities – to return as a ref who brought his whole self to the game, and to lend his voice to the fight for improved LGBT inclusion in football. Months later, Atkin declared himself “a happier person” for the whole experience – his refereeing duties continue, and he’s also become a respected figure off the pitch, speaking with integrity to the media (such as CNN, and also in the below Facebook Live video on Sky News during Rainbow Laces Week), as well as advising the game’s governing bodies. I would never have done it five years ago but I thought if it can help anyone else, then it’s worth it. I’m not a big trailblazer of gay people, but I am glad I have done it. In May, Squash Magazine ran an article by James Zug titled ‘Love is Love is Love’, about the former women’s world number two Jenny Duncalf, and her partner – and often her opponent on court – the Australian squash player, Rachael Grinham. Duncalf and Grinham’s relationship began over nine years ago, making their ‘coming out’ story more unusual for this list; yet this was the first time the couple had discussed it in sports media. Later in the year, Duncalf, who was brought up in Harrogate, spoke to the Yorkshire Post’s Ed White and played down the earlier interview – “it wasn’t a massive big deal” – but even so, she was happy to have done it. An extra confidence boost, we hope, for Duncalf to take into squash’s showpiece event, the Commonwealth Games (squash is still not an Olympic sport, somewhat ridiculously) on Australia’s Gold Coast early next year. I’m not saying I would’ve won the Olympics but, if I wasn’t subconsciously processing all this stuff, I would have achieved more. One of Britain’s greatest ever swimmers, Foster won titles and medals galore at the Commonwealth Games, the World Championships and the European Championships – but he never touched home for Olympic gold. In an interview in November handled with characteristic insight and sensitivity by The Guardian‘s Donald McRae, Foster – now 47 – laid bare his melancholic reflections on a career that many of his rivals might have envied but that inside he felt could have brought greater glories. A quick note… thank you @donaldgmcrae for doing such a fantastic job… I could not have asked for more… the response has been unbelievably positive…. When you’re a person of colour, you’re already out there ‘noticed’, and you’re very much a minority… you don’t want to put yourself in another minority group again. Colin Jackson shared an apartment with Mark Foster in Bath about 15 years ago, although their busy international sporting schedules meant they were rarely there at the same time. No doubt there’s been some reminiscing between the old friends and occasional flatmates in recent months. Jackson, one of the world’s greatest ever hurdlers, was interviewed in August for a series called ‘Rainbow Heroes’ on Swedish TV channel SVT, hosted by two other former international athletics stars, Kajsa Bergqvist and Peter Haggstrom. He had never spoken publicly about his sexuality before. “How come you do it today?” asked Bergqvist. “Because you asked,” replied Jackson. 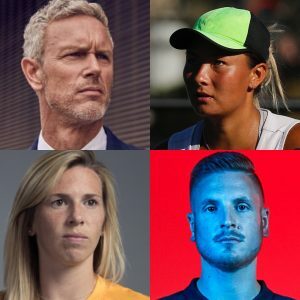 It’s not a question many would feel comfortable asking, but every LGBT sportsperson has their own story to tell – sometimes they just need to be gently encouraged to tell it. I want to be open about things, because then people are less inclined to speak behind your back about it… I don’t want it to be something that people think I’m scared, sad or upset about. Tara Moore, the top-10 British tennis player, proposed to Switzerland’s Conny Perrin in September 2016, at Lake Garda; Conny said yes, and the two WTA players hope to celebrate their wedding day in Thailand in 2018. A year after their engagement, Moore and Perrin spoke to the New York Times’ Ben Rothenberg about life together on the women’s tour, being doubles partners – and on one occasion, playing against each other. Like Duncalf and Grinham in squash, they were keen to appear unremarkable, leading to some amusing quotes (such as Tara on how her and Conny finish up a training session – “we give each other a high-five; it’s not like we start making out on the court”). Rothenberg also wrote of the WTA’s lack of acknowledgement of its LGBT legacy, even in the light of the Margaret Court controversy. Even if that legacy’s historic strength makes official WTA input on such matters unnecessary, it’s heartening to see Moore and Perrin continuing to provide visibility in women’s tennis. Being gay wasn’t just a small detail in my life, it consumed it. It’s all I would think about. But now that I have come out, it rarely crosses my mind. California – the perfect place in the US in which to be LGBT? Not entirely. Ryan O’Callaghan grew up in Redding, in the north of the ‘Golden State’. As Cyd Zeigler notes early on in his compelling Outsports interview with the former New England Patriots and Kansas City Chiefs lineman, this is “a deep red corner of a blue state” – and not an easy environment in which to grow up gay. O’Callaghan threw himself into football with such determination that it took him all the way to the NFL. Throughout it all, the closet door was held firmly shut. When injuries brought his career to an end in 2011, he had even more time to spend with his own thoughts and feelings – and so his abuse of painkillers began, and increasing contemplation of suicide. It’s at times a dark tale, but illuminating too, with O’Callaghan eventually lifting off the weight of shame with the help of a psychologist and the Chiefs general manager. I was asking the players and staff to trust me 100 per cent with their lives but I wasn’t trusting them with mine. So after two years, I felt I had to be more open. One of the LGBT stats that often provokes surprise is the estimated percentage of young people who are out, but then go back in the closet when they start their first job (62% of graduates, according to a 2014 study by the Human Rights Campaign). Hugo Scheckter was one of those people. The son of former F1 world champion Jody, he came out at the age of 21 while at George Washington University. Three years later, he became Southampton’s first player liaison officer, a role created by then manager Ronald Koeman – and with a quirky sense of self-deprecating humour, he soon became a popular figure with the fans as well. He feared being out would be “a distraction” and ended up being someone who was “really vague” when conversations turned to his life outside of work. So after a two-year settling-in period at St Mary’s, he came out again, this time to his football family. He also posted on social on National Coming Out Day last year, and in an interview in August with The Times sports editor Alex Kay-Jelski (of this Sports Media LGBT+ parish), he told the whole story to the media for the first time. A host of Saints players past and present sent supportive tweets. I’d love for Georgia to get on the pitch [in the World Cup final] but if she doesn’t, I’ll be proud anyway. The most ‘low key’ of the stories on this list, but special in its own way – two England international sportswomen happy together, and their relationship just casually dropped into conversation by Telford in a BBC Sport interview in July. The Chelsea goalkeeper, in Holland with the Lionesses at Euro 2017, was hoping her girlfriend Elwiss would end up a Cricket World Cup winner with her squad, at Lord’s. She did just that, with England winning the final in thrilling fashion – and it was watched by over 100m people worldwide. Meanwhile, England’s Euros football challenge may have been ended by the hosts at the semi-final stage, but it was a summer of British sport where the girls came to the fore. Social followers of Telford and Elwiss would have been used to sharing in their adventures but as far as we could tell, this was the first time either had made mention in the media. A sign of ‘normality’, perhaps, but a significant one for LGBT visibility in sport nonetheless. You’re in denial to everyone, you seem happy-go-lucky and outgoing, but when you’re on your own and climb into bed at night, it’s on your mind and it wears you down. Hypermasculinity continues to make ‘macho’ male sports the toughest of arenas for gay men. The former racing driver Danny Watts, a class winner at the famous Le Mans 24-Hour race in 2010, spent 20 years in motorsport, experiencing thrills and spills, highs and lows – and at various junctures, the depression of being in the closet. In February, having ceased competitive racing, he came out in a simultaneous series of publications, including Autosport – “one big hit”, as he’d later call it. In a motorsport world discussing whether it’s still suitable to have ‘grid girls’, and the circuit of different grands prix and races regularly entailing visits to countries such as Abu Dhabi and Russia, LGBT diversity is almost always a speck in racing’s rear-view mirror. Watts’ words will have accelerated acceptance for other drivers and for the man himself, “a really good feeling” was the long-term reward. In terms of my personal and professional development, I think this is the right time to return to a more active role in cycling too – the sport I’ve always loved. For many elite sportsmen and women, retirement is a signpost which – should they choose that path – marks the route from active participation to the commentary box. Having last cycled competitively in 1995, Philippa York only reached that destination in July of this year, after taking a road none before her had travelled down. Her columns for Rouleur Magazine, bylined under her previous name, had kept the former Tour de France King of the Mountains winner in cycling’s consciousness. Now, with Britain having produced two Tour winners in the last six years, her expertise and insight meant she was being asked by media colleagues to contribute more vocally and visibly. But still the decision had to be made – to maintain a low profile, or step out into public view? She chose the latter, supported by allies in print (such as Daniel Benson of Cycling News) and broadcast. The sport loved having her back, and by the year’s end, York was speaking in front of audiences at the Rouleur Classic event and even went back to Glasgow for the first time in 20 years for a feature on BBC Scotland‘s Timeline programme.